Iodine is one of the most important of the many minerals and oligo-elements necessary for human health. The benefits of iodine supplementation have actually been recognised for over a century. Named after the French chemist Jean Lugol, this iodine-potassium iodide preparation has been used since the 19th century to treat thyroid dysfunction. Following the discovery of its numerous other properties, it has been the subject of significant renewed interest in recent years. Iodine’s main function lies in the production of T4 and T3 hormones by the thyroid gland. Dr David Bronstein, one of the world’s foremost experts on thyroid and iodine, believes that 95% of the population is deficient in iodine. Supplementing with Lugol solution thus offers an effective way of compensating for such deficiencies. In 2007, Dr Chris Robin published a book called “Iodine Remedies: Secrets from the Sea” in which he outlined the many other therapeutic properties of this iodine-potassium iodide combination, for both internal and topical use. These include beneficial effects against tumour growth, ovarian cysts, allergic and auto-immune reactions, keloid scarring, fistulas, haemorrhoids, sebaceous cysts and vaginal infections, as well as Dupuytren’s and Peyronie’s disease. However, credit should also go to Dr Jonathan V. Wright for exploring new applications for this iodine-potassium iodide solution. In particular, he showed that the development of breast cysts (fibrocystic breast disease), which was affecting over 50% of all menopausal or peri-menopausal women, could be controlled by a Lugol-based treatment without suppressing thyroid function, when administered for three to six months at an average dose of just 9 drops a day. Other research has shown that Lugol solution may act in a preventive and therapeutic capacity against certain cancers, particularly breast cancer. This is due to iodine’s ability to interact with oestrogens. Iodine promotes the metabolism of two pro-carcinogenic oestrogens, oestrone and 16-alpha-hydroxyestrone, into oestriol, a neutral oestrogen. Among other studies, research conducted by Professor Abraham and his colleagues has emphasised the existence of a direct relationship between lung cancer and inadequate iodine intake. Japanese women who have a good intake of iodine have the lowest rates of lung cancer, as well as of ovarian and uterine cancer. Supplementing the diet with 60 drops of Lugol a day will enable basic iodine requirements to be met and will bring intake closer to the Japanese average, without necessarily having to add algae (laminaria, wakame, kelp) to every meal. This is a pure solution that contains none of the commonly-added agents such as disinfectants (like benzalkonium chloride). Inexpensive and effective with broad-spectrum activity, this solution should form an essential part of any family health kit. Warning : Lugol should not be used as an adjuvant or support for slimming treatments since it increases thyroid metabolism; similarly, it should not be taken alongside high doses of caffeine because of the potential stimulant effect. It must be diluted in a glass of water. 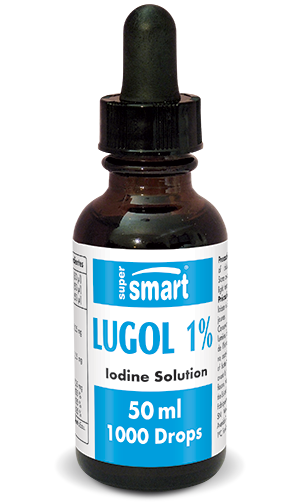 Warning: Lugol should not be used as an adjuvant or support for slimming treatments since it increases thyroid metabolism; similarly, it should not be taken alongside high doses of caffeine because of the potential stimulant effect.